Wellies high grip, and oil-resistant, our yellow wellies also have protected soles and metal toe-caps. Helmets are fitted with inflatable liners, foam inside, and visors. They are marked up with high-visibility reflective strips, and velcro pads to allow torches and other equipment to be attached. ILB helmsman helmets also have earpieces to make communication with Coastguards easier. Some of our helmets are fitted with cameras to record our work. All-weather Lifeboat Trousers and Jackets. Built for the most extreme off-shore conditions, protection whilst on deck is provided by waterproof trousers and jackets. Jackets have high fleece-lined collars, and fluorescent hoods. Arm and leg openings have velcro cuffs to keep the water out. Lifejackets are also ﬁtted with highly visible reflective patches. Jackets for use on the ILB have built-in buoyancy even without inflating the jacket. The buoyancy is increased by inflating the jacket, achieved by pulling the inflation toggle. All-weather lifeboat jackets do not have built-in buoyancy but inflate automatically (within seconds) when in water. Lifejackets also have lifting strops, personal safety harnesses, a whistle, a light, and a spray hood. In the pockets are the essential cards for casualty care treatment. ILB Drysuits. As well as built-in bouyancy differences between the ALB and ILB lifejackets, there are other differences between ALB Personal Protective Kit and ILB Personal Protective Kit. 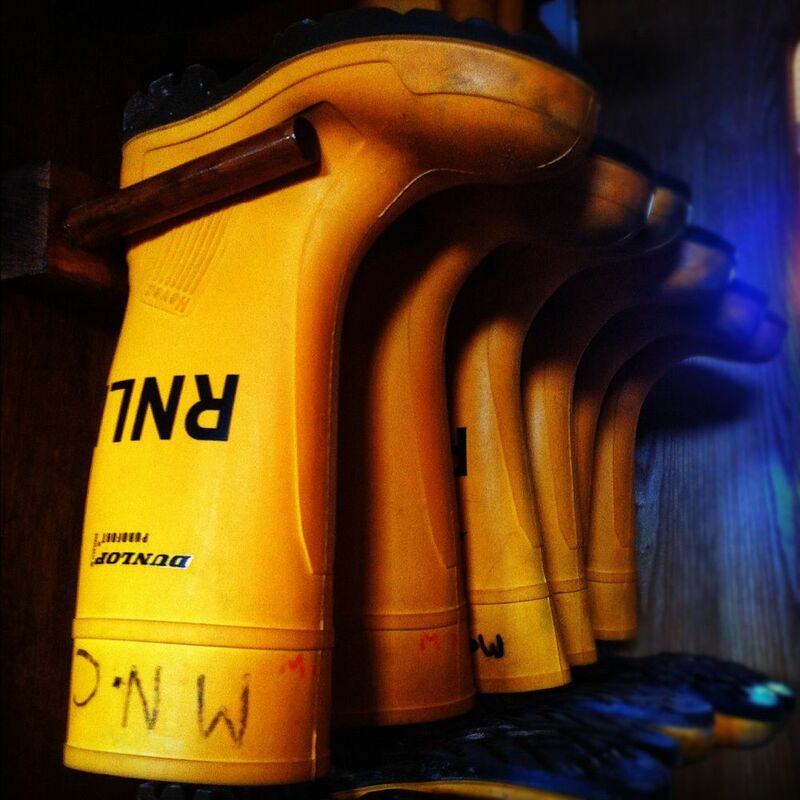 ILB crew wear all-in-one dry suits, which have the the recognisable RNLI yellow wellies welded on. Underneath this they wear a fleece bodysuit. Together these differences protect the ILB crew who are more exposed to the elements, more likely to get wet, and more likely to find themselves in the water.